As technology continues to evolve, the potential continues to grow, and various devices have now been implemented into mainstream society. Virtual reality was first designed with no limits. Although used to enhance movie and gaming experiences, virtual reality has the ability to change the future of non-entertainment areas, such as business and medicine. Currently being used to treat PTSD and to train medical students, virtual reality has the ability to immerse viewers into a three-dimensional world. Essentially, virtual reality technology ensures that any and every experience can be accessed by the push of a button. With the world at our fingertips, the VR Box Virtual Reality Glasses feature 3D technology that allows users to experience a dynamic virtual view experience wherever and whenever. These virtual reality glasses provide users with a 1000-inch big screen with a distance of 3 meters. Ideal for movie lovers or video game players, the advanced technology and design of the VR Box Virtual Reality Glasses offer a unique experience that caters to comfort and quality. Featuring a flexible, adjustable headband, the VR Box glasses are designed to fit most head shapes and sizes. As mentioned previously, the glasses are designed for comfort. Featuring an adjustable pupil distance and sight setting, it allows users to optimize the glasses to suit their individual needs. Furthermore, the glasses can also be worn with prescription glasses, allowing individuals with various eye conditions to enjoy the experience of virtual reality. Ensuring that users will be thrown in the middle of action, the VR Box 3D glasses allow the users to experience maximum entertainment without the dizziness or visual fatigue that can often occur during 3D motion pictures. Additionally, the device features a soft sponge cushioning around the edge of the glasses, allowing them to be worn for long periods of time without discomfort. 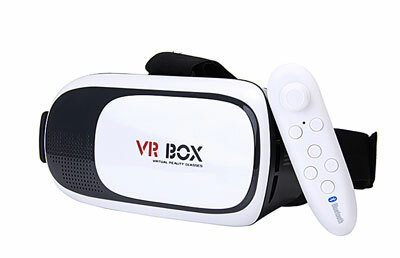 A budget friendly device, the VR Box 3D glasses features Bluetooth remote control that can be used with iOS and Android smartphones that measure between 3.5-6 inches. The device comes with a user manual that allows buyers to set up the device. The VR Box glasses work by implementing dual-optics as well as side-by-side imaging, combining them together to create the 3D video or image. For initial use, users should test the VR Box glasses to customize optical settings. First, users should select a video from their phone or on the internet, once selected, users should then place their smartphone into the plastic insert found in the VR Box. Users should then put on the VR Box headset and adjust the optical settings until the image until the image is clear. Featuring a compact, lightweight, modern design, the VR Box is fitted with specifically designed, 42mm diameter spherical resin lenses. Immersing the user into the world of virtual reality, the screen can be adjusted for optimal viewing. The optical adjustment setting allows the user to move each lens individually for different ways: forwards, backwards, right, and left. Offering a diverse range of focus, the optical axis is optimized for ease. Supporting 3D split screen, the VR Box does not limit experiences, whether game or movie. Optimized for video game playing, the VR Box comes with a Bluetooth game controller that is designed to amplify the playing experience. In order to set up the game controller, users must simply select it from their Bluetooth settings in their smartphone devices. The controller works extremely well, and can also be used for games that are not just compatible with virtual reality. Designed to provide users with an immersive gaming and movie experience, the VR Box provides clear and bold visuals, providing vibrant colors and a realistic exposure. Using the Bluetooth controller that has been added for convenience, it is recommended that users complete the virtual reality experience by purchasing virtual reality games that can be found in the Google Play Store or Apple App Store. Although the number of virtual reality games feature a limited amount, users should find games and apps that are compatible and optimized for a virtual reality experience. Although virtual reality games may be lacking, there is a large number of virtual reality videos that can accessed through a variety of online platforms, such as YouTube. VR Box Virtual Reality Glasses are available for purchase on the Rok7 website (www.Rok7.com). Offering free shipping within the United States, the price for the VR Box Virtual Reality Glasses is currently $42.99. The Siren Song is a personal self-defense siren that can be activated to deter attackers and alert those nearby. Here’s our Siren Song review. What is the Siren Song? The Siren Song is a small keychain devices that packs a powerful audible punch. When activated, the Siren Song lets loose a 130 decibel alarm. The device also features an LED light. The goal of the Siren Song is to deter attackers or to call for nearby help when you’re in trouble. The alarm can be heard from a distance. As the makers of the Siren Song explain, the device “keeps women, and children safe at all time”. It can be attached to your keychain for convenient access. It also looks a lot like a wireless car key, so attackers may not realize you have a personal self-defense tool. -Keychain: Compact keychain makes it easy to hold the Siren Song at all times. -130 Decibel Alarm: You can hear the Siren Song from a long distance when activated. -Built-In Flashlight: Powerful LED lets you see in the dark whether it’s late at night or you’re deterring an attacker. -Unique Design: The Siren Song was designed by a team of engineers. That design purportedly amplifies sound. As you can see, the price per device declines sharply the more you buy. The company claims that the device normally sells for $80 at its retail price. However, we couldn’t find any evidence that the device is sold for that price online anywhere. All purchases come with a 30 day money back guarantee. Who Makes the Siren Song? A quick Google Search shows that the address is associated with a company named Caelum LLC. That company has previously marketed products online like Dermacool Beauty Ice Roller or Magic Lips. It’s unclear if this company makes the Siren Song itself, or if this is just a whitelabel rebrand of a cheaper product (my money is on the latter). Should You Buy the Siren Song? The Siren Song is one of many personal alarm devices available today. Unfortunately, it seems significantly higher-priced than most of its competitors. There’s a GE Personal Security Keychain Alarm sold through Home Depot, for example, for just $6.18 USD. Amazon also sells a 130 decibel keychain alarm called the “Vigilant” at a price of $15.99 USD. That device appears to have virtually identical features to the Siren Song, included the LED light. Similar devices can be found on Amazon for between $8 and $15, including keychain pepper sprays for as little as $6. Ultimately, the Siren Song is a valuable self-defense tool that can protect anyone from harm. It will deter attackers and alert anyone nearby to your situation. It’s also conveniently shaped like a wireless car key – so it’s discreet on your keychain no matter where you go. If you pay $40 per Siren Song, you’re paying way too much. Similar devices are available between $7 and $15 online through Amazon and other retailers. However, if you’re buying 8 devices at a time, the $10 per unit deal on the Siren Song looks pretty good (of course, who needs 8 personal safety alarms?). When it comes to protecting family and loved ones, most people agree that no price is too much. This is why so many people spend huge amounts on security systems, safe cars, and health and life insurances. All these extra steps are taken to make sure that people and their loved ones are ready for any situation and will be safe through the most harrowing times. However, even though many people put a lot of thought into how they can care for their loved ones, usually these plans still depend on the basics. People don’t often think how they would be able to protect their loved ones if there was no transportation, water, or, even rarer, electricity. The CK2000 Tactical Flashlight, sold by ApexBeam, is the perfect solution for those who want to be prepared in all things. The powerful beam of the CK2000 will provide enough light even on the darkest of nights. Plus, the heavy body of the tactical flashlight is perfect for self-defense. What is the ApexBeam CK2000? The ApexBeam CK2000 is a tactical flashlight that makes it easier than ever for users to get the light source they need with the quality body that will last through the worst situations. Made from aircraft-grade aluminum, the CK2000 is light and easy to carry, making it an unobtrusive device to carry on a daily basis. However, the lightness of the flashlight is quite deceiving, since the flashlight is resilient and able to take a beating. The number one reason most people buy flashlights is to have a light source in places and at times where light is unavailable. Even though the body of the ApexBeam CK2000 is one of the first things people notice about the tactical flashlight, its true power is found in its lighting capabilities. The compact Tactical Flashlight uses a Cree LED lightbulb, which gives it about 100,000 hours of light. And the light that the CK2000 produces is unlike any other, though more of this is explained below. For those who think that they can purchase any flashlight and get the support they need, the CK2000 is able to show the folly in these thoughts. While there are many flashlights on the market, none offer the many benefits and features that come with the CK2000. The compact, durable tactical flashlight is going above and beyond when it comes to providing the support users need when it comes to lighting the darkest, scariest areas. ApexBeam is proud to support jobs in the United States, which is why the CK2000 is designed and shipped in the country. Not only does this help the company keep closer tabs on quality control, but it allows customers to get their products faster. The biggest benefit of the CK2000 is found in the quality of the light it provides users. To better understand the quality of the tactical flashlight and its beam output, an understanding of regular flashlights is needed. In most flashlights, those purchased at a regular store, the light output is around 100-500 Lux. This output will bring light to part of a small room, but the batteries will need to be replaced often. A 500-1000 Lux flashlight is a bit higher-end and can light part of an outdoor space, though not very far. To put this in perspective, the CK2000 is 2000 Lux, which is considered a professional-grade output and can light up an entire football field, making it one of the brightest flashlights available. Another big benefit of the CK2000 is its versatility. As mentioned above, the tactical flashlight is made of the highest quality aluminum, making it light and compact, but very tough. Due to the size and weight of the CK2000, it can be used for a wide range of purposes. It can be kept in the car to be used in case of a breakdown. It can be attached to guns for law enforcement, military personnel, or security. For those who are out in the wilderness, the CK2000 is perfect for hunting and camping. And, because it is IP65 Standard waterproof, the CK2000 is an ideal tool for fishing trips. The CK2000 was designed to be easy to carry and use. The body of the flashlight is made with an anti-slip design, so even in the harshest conditions, users will be able to keep a firm grasp on the tactical flashlight. The CK2000 also has an anti-roll housing cap and overheat protection, making it perfect for all sorts of situations. Plus, the CK2000 has an illuminated tactical tail switch, so users can always see what they’re doing. One of the worst things about other flashlight options is that they require constant changes of batteries, which can get very expensive very fast. Even though the CK2000 offers a brighter light than any regular flashlight, it doesn’t burn through its batteries like other options. More importantly, the CK2000 comes with convenient power options. Users will be thrilled to know that the CK2000 comes with the rechargeable AAA battery that powers the device, but also a wall charger for the rare charges needed to keep the CK2000 running at optimum. As an added bonus, for those who purchase the CK2000 today, the flashlight comes with its own tactical case. The foam-padded, durable case doesn’t just protect the CK2000 and its accessories, but it also comes with a carry strap that makes it easier than ever to travel with the tactical flashlight. There are several purchasing options available on the ApexBeam website for those who are interested in getting their CK2000 tactical flashlight. A list of these different purchasing options can be found below. All purchases of the CK2000 also come with a 30 day, money back guarantee. If customers are not satisfied with their purchases, they can return the products within 30 days and get a full refund, no questions asked. Virtual reality has, until recently, been something that gamers, nerds, and tech enthusiasts dream about. However, as technology has advanced over the past decade or so, virtual reality hasn’t just been a dream, but something that people across the world can access. Virtual reality is being used in arcades and other spaces everywhere. However, even though there is more access to virtual reality machines, having these devices be readily available for at-home use is still a challenge. In the past few years, it has become a goal of many companies to make virtual reality something that can be done at ease from the safety of home. This meant making machines that were both portable and priced right for those who want to experience the power of virtual reality at home. While portable virtual reality options are no readily available, the price points on many of these options is still way too high for the average person. As a way of combating the high prices of virtual reality machines, Astoria VR created its own version, which can easily be used with any phone. By offering a cheaper, high-quality virtual reality headset to the masses, Astoria VR is finally allowing people to live the dreams they’ve had for years. Astoria VR is a headset that uses the power of the phone to give users the virtual reality experience for which they’ve dreamed. Because phones are some of the most powerful computers of this age, Astoria VR realized it could cut the cost of virtual reality headsets by using phones to power it. The results is a headset that can fit all smartphones, giving users the chance to delve into the world of virtual reality. For those who are ready to escape reality, Astoria VR offers the perfect opportunity. The headset is made so that a smartphone can easily be clipped in. By accessing the dozens of games and apps that can use Astoria VR, the headset is able to give users 360 degree views, as well as 3D experiences, all from their phone. And, Astoria VR is able to provide all these amazing aspects of virtual reality without the expense of other headsets on the market. For those who want the experience without breaking the bank, Astoria VR is the perfect solution. The Astoria VR headset is designed and feels just like the other headsets on the market that are hundreds of dollars more expensive. With a front plate for augmented reality capabilities, side knobs for adjustments, an ergonomic designs, as well as an eight layer nano-coated lens for the highest quality picture, Astoria VR is make virtual reality more accessible to the masses. For those who have longed to have a virtual reality headset of their own, the biggest benefit of Astoria VR is a combination of its quality and its price. People want a real headset, but don’t want to pay the exorbitant prices that so many require. Without sacrificing quality, Astoria VR was able to provide users a headset that will give them all their virtual reality dreams, but at a fraction of the cost of other headsets. Even better, Astoria VR offers discounts on its per unit price the more units people purchase. Just as important as price and quality is the convenience of Astoria VR. As mentioned above, there are many virtual reality headsets available on the market today, but most of them require huge amounts of setup before they can be used. However, Astoria VR uses the power of smartphones to give users the experience they want. Because Astoria VR headsets are powered by these phones, there is no setup required. As soon as customer receive their Astoria VR, they can immediately begin using it, escaping reality into a world of games, videos, and other viewing experiences. When engrossed in their virtual reality, the last thing someone wants is a grainy picture. Astoria VR is able to provide some of the sharpest, clearest pictures through its various apps and games. Not only will users of Astoria VR get a full 360 degree experience, they’ll also be able to get 3D capabilities that go up to 1080p in quality. The quality of the picture with Astoria VR helps pull users in, so they can be completely engrossed by the experience. As mentioned above, using the Astoria VR headset is simplicity itself. First, no setup is needed, so as soon as it arrives, users can get started. The first step in using the Astoria VR headset is picking a VR app. This is probably going to be the hardest part of the entire process, since Astoria VR allows users to access a wide range of apps, games, and videos. Astoria VR supports NYTVR, Discovery VR, Netflix, and Hulu, as well as dozens VR compatible apps. The assortment will keep owners of Astoria VR busy for days. Once users of Astoria VR have picked their app of choice, they can place their phone into the headset. Astoria VR is compatible with all smartphones and supports screen sizes from 4.7 inches to 6 inches. This vast range allows users of varying operating systems and phone types to use Astoria VR without a worry. When the phone is in place, users can comfortably fit the device on their heads, using the ergonomic design and comfortable foam cushion to stay comfortable. With the varying knobs and adjustments, users can position and rotate their VR experiences to their desires, making Astoria VR not only the easiest headset to use, but also the most adjustable. When users are comfortable, they can start enjoying their new virtual reality. As mentioned above, the whole goal of Astoria VR was to offer an affordable VR experience to those who might not otherwise have access to these types of devices. The good news is that through a lot of hard work, Astoria VR was able to keep its headset at the low price of $59. However, for those who want to purchase multiple headsets, the news gets even better. The more units of Astoria VR users buy, the more they’ll save. Some of the discounts Astoria VR customers can get are listed below. For those who are looking for holiday presents for the family, these discounts make it easier than ever to give the gift of virtual reality this season! What is the Falcon Tactical Flashlight? The Falcon X800 is a compact flashlight made from aircraft carrier aluminum which makes it not only extremely durable but also lightweight. The Falcon X800 Flashlight only weighs 5.71 ounces. The Falcon X800 Flashlight contains several features that make it perfect for casual use or in disaster situations. How Does Falcon Tactical Flashlight Work? The Falcon X800 Tactical Flashlight runs on three AAA batteries. This lightweight and durable flashlight offers users five different light settings with easy to use controls. This flashlight glows at a bright 800 lumens and offers a zoom from 1 to 2000 times. Users can choose between high, medium and low beams as well as a strobe setting and S.O.S. setting. The flashlights casing is waterproof and the aircraft carrier aluminum, this device is strong. Users will appreciate the versatility and durability offered by this product. The Falcon X800 Tactical Flashlight is small and compact allowing it to fit easily in a pocket or bag. The battery life is over 100,000 hours on a fresh set of batteries. Users can purchase their flashlight to include in their emergency preparedness kit and know that they will work if the time comes to use them. Whether users live in hurricane prone areas or oversees without reliable electricity, the Falcon X800 Tactical Flashlight will give users the freedom to see when it is most needed. The Falcon X800 Tactical Flashlight is small measuring at 5.31 X 1.38 X 1.26 inches and weighs less than six ounces! This flashlight is only $8.99 each on www.amazon.com making it affordable enough to have multiple items around your house, car, and office. People who camp love the Falcon X800 Tactical Flashlight for its ultra-bright beam and waterproof qualities. Members of the military love this light for its durability and dependability. Additionally, the Falcon X800 Tactical Flashlight can be used six feet underwater for up to thirty minutes. -Construction and maintenance workers and truck drivers all need one! Keep a Falcon X800 Tactical Flashlights in the car and throughout the home, it is good to be prepared for the possibility of being in the dark. Whether dealing with a midnight flat tire or prepping dinner on a camping trip, users will appreciate the quality and versatility of the Falcon X800 Tactical Flashlight. Members of the military, the Peace Corps, and everyday people will find so many uses for this light. Tired of low quality flashlights or products that simply do not live up to their company’s claims, then checkout the Falcon X800 Tactical Flashlight. Made of durable aluminum and packed with a long lasting bulb, users will appreciate how strong and reliable this flashlight truly is. For only $8.99 per light, this device is a good value and good quality. Imagine having a flashlight that will last for years, the Falcon X800 Tactical Flashlight will replace all of the cheap flashlights around the home. Users of the Falcon X800 Tactical Flashlight rave about its super bright beam and how lightweight it is. Having the ability to choose from five light quality settings is a great feature that makes the Falcon X800 Tactical Flashlight stand out from its competitors. The best price available online for the Falcon Tactical Flashlight is at www.amazon.com. Consumers can buy one Falcon Tactical Flashlight for $8.99. This item is eligible for Amazon’s free shipping for qualified purchases over $49.00. www.falcontacticalflashlights.com offers the Falcon Tactical Flashlight for $56.00 each. They are normally $116.00 each but are on 75% off special. Falcon tactical offers quantity discounts, please read below for more details. Buy three Falcon Tactical Flashlights and get two free. $145 .00 is the total cost which makes each flashlight $29.00 each. Buy two Falcon tactical Flashlights and get 1 free. $117.00 is the total cost which makes each flashlight $39.00. Two Falcon Tactical Flashlights cost $97.00. This makes each flashlight $48.50. Four Falcon Tactical Flashlights cost $169.00. Each flashlight at this level is $42.25 each. Ten Falcon Tactical Flashlights will cost $350.00 making each flashlight only $35.00 each. Larger quantities are available but the price remains at $35.00 each. Orders ship for free within the contiguous United States. Falcon Tactical Flashlights offers a limited money back guarantee on purchases made within thirty days. Who Produces Falcon Tactical Flashlight? Falcon Tactical Flashlights is based in Las Vegas, Nevada. Should You Use Falcon Tactical Flashlight? Consumes looking for a high quality light source for everyday life or emergencies should definitely check out Falcon X800 Tactical Flashlights. Users who are sick of spending five to seven dollars on a good looking flashlight and having it break within months will appreciate a high quality, long lasting option from Falcon Flashlights. With up to 100,000 battery life on one set of AAA batteries, users can rest assured they will always have a light source when they need it. Made of strong aircraft carrier aluminum and utilizing a high quality bulb, the Falcon X800 Tactical Flashlight offers high quality beam in a lightweight and strong package. Visit www.amazon.com today and get a super durable flashlight that will last for years, the best part they are only $8.99 each. Check them out today and order now to be prepared for anything. LithiumCard Pro – World’s Fastest Device Charger? LithiumCard Pro is a fast charging device that promises to be “the world’s fastest charger for every device.” Does it really work? Let’s find out today in our LithiumCard Pro review. LithiumCard Pro is a small portable charger that promises to work 300% faster than the standard Apple iPhone charger. You can use the device to charge two phones or tablets simultaneously. And, it comes with built-in charging cables that work on Android (through USB) or Apple (through the Lightning connector). The charger is available online through LinearFlux.com, where it’s priced at around $60. Let’s take a closer look at some of the features on the LithiumCard Pro. The LithiumCard Pro claims to work using a proprietary “HyperCharging” technology created by Linear Flux engineers. This technology uses algorithms to measure your device’s electronic charging capabilities and then communicates with your device to achieve the most optimal charging curve. That’s just a bunch of fancy talk to say that the charger looks at the maximum amount of current your device can accept, and then it provides that current. Since most devices cannot draw more than 1.10 to 1.30 amps (it’s a safety feature), you’re not going to enjoy faster charging on most electronics. The makers of LithiumCard Pro claim they’ve designed their charger to have a “super low parasitic design” which means it will hold a charge for a year or more. It can also operate at peak efficiency for 1000 cycles, which means it will be able to go from fully charged to fully discharged 1000 times without impacting its efficiency. Once your device is fully charged, LithiumCard Pro is also smart enough to turn off the charging cycle – so your device won’t be impacted by “overcharging” (although this is a non-issue on virtually all modern devices – you can safely leave a phone or tablet plugged in overnight past 100% without impacting its long-term battery life). The online store accepts all major credit cards. The NanoStick pads, as mentioned above, can be used to stick your LithiumCard Pro to any surface. The manufacturer recommends using it to stick the charger to the back of your cell phone or tablet so you always have an extra charge close by. The prices above come from the official Linear Flux website. However, the same charger is available from Amazon, where it’s priced at $27.99 with free shipping. That’s much more in line with the price we see on other chargers, but it still makes LithiumCard Pro towards the higher end of the spectrum. What Do Customers Have to Say About the LithiumCard Pro? The LithiumCard Pro isn’t particularly well-reviewed online. Many people call it a scam or sham product that doesn’t work as advertised. On Amazon, the average rating is 2.7 stars out of 5. There are more 1 star reviews than anything else. The product did go through a legitimate Indiegogo campaign. However, customers who purchased their charger through that campaign are now having significant problems with the device. It worked well for the first 4 to 8 months, and then suddenly stopped taking a full charge (customers report that it only charges to 5 to 10% of its former capacity). Considering the charger claims to work for 1000 cycles, that’s not a good thing. Some customers complain their charger stopped working after just 5 months. Other customers complain about the poor build quality of the device, which uses a thin layer of cheap tape to secure the metal cover to the chassis – which means it’s easy to remove. Ultimately, LithiumCard Pro advertises a capacity of 3000 mAh, but it appears many people have trouble drawing that amount of battery life from the device. It’s also important to remember that a growing number of modern smartphones have a battery capacity higher than 3000 mAh – so even on its best days, the LithiumCard Pro won’t be able to fully charge the latest Galaxy Note or an iPhone 6 Plus. Should You Use the LithiumCard Pro to Charge your Electronics? The LithiumCard Pro claims to be the world’s most powerful charger. In reality, the product is poorly-reviewed online and has faced a wave of complaints about build quality and reliability. It may be able to fully charge older smartphones – like an iPhone 5. But customers have reported that it doesn’t get modern smartphones – even last year’s Galaxy S6 – anywhere near a full charge. One of the few benefits of the LithiumCard Pro is that it is small, compact, and portable. If you need an extra 10% to 15% boost to get you through the last part of the day, then the LithiumCard Pro may be able to provide that boost to you. However, the portable charging market is incredibly crowded. Priced at $60 on their official website, LithiumCard Pro is significantly more expensive than its competitors. Even on Amazon, where the original LithiumCard is priced at $28, you’re probably paying too much. There are simply plenty of better options at a lower price range – and the “faster charging” thing doesn’t even work on most electronics (manufacturers impose charging limits to avoid the risk of overheating). Based on all of this information, you might want to re-consider buying the LithiumCard Pro.